You have to go the the Stribling site to see pictures, but the floor plan is on StreetEasy. This is your classic Long-and-Narrow footprint with a rather extravagant set of 7 windows on the long east wall. Plumbing is widely spaced on that east wall and there’s a stack for the washer-dryer on the west fall. At 23 feet wide at each narrow end, there is room for multiple rooms in the back; in this case, a master suite and a sequence of home offices, though this could easily support side-by-side master and second bedroom. Typical of full-floor Manhattan loft footprints, the middle of the loft is more narrow than the ends, where the common hallway, fire stair and elevator pinch into the residential footprint, but in this case that is a relatively long pinch (more than half the length). The grown-ups have allocated to themselves a master suite with two home offices at the rear, leaving anyone else who sleeps there to use one of the two “sleep areas” in the pinched area along the long east wall. Props to the floor plan designer: the sleep areas are big enough to be legal “bedrooms” and each has a window; I assume they are called “sleep areas” because those windows are on the lot line. Here’s where that pinch truly pinches: in a loft of “1,800 sq ft”, the smaller sleep area is 9 x 11 feet before considering that it is further pinched by a structural column. That’s what can happen when the grown-ups take up all the prime sleeping space across the broad rear. This home with 11 ft ceilings and WBFL enjoys RARE open city views through large picture windows in the open living/dining/ kitchen area. Currently this loft accommodates a master bedroom, two additional sleeping areas PLUS two offices (one with a large window). Fully finished with prewar details and featuring C/A/C, private storage area, great closets, laundry room with sink and hardwood floors…. Of course the sellers wanted more than they paid at The Peak, but they were negotiable: they came out at $2.495mm on May 10 and worked to 10% discount to sign a contract within 7 weeks, closing at that $2.25mm on September 7. That suggests either that sellers knew they were unlikely to get their 2008 purchase price, or they were quick learners. Good for them. I am surprised by the value of all those windows on the 8th floor, and of what is outside them. I wouldn’t necessarily call “open city views” from an 8th floor loft in Tribeca “rare”, as these selling agents babbled it, but their value is on the order of $700,000 … one-third of the value of the loft! That surprising math is based on the December 8, 2011 sale of the 2nd floor (exact same footprint, equal or better condition) for (only) $1.525mm. Maybe the 2nd floor floor plan is less attractive than on the 8th floor, with the ‘master’ bedroom squeezed into the front (a long walk to the bathroom), leaving a public space (kitchen, dining, living) that has a bowling alley feel (say, 14 x 56 feet) and a master bedroom with walls that do not reach the ceiling. I can imagine a market discount for that layout, but $725,000 is rather extreme. The 2nd floor babble boasts of “south [windows] providing beautiful daylight in the living room, dining area and master bedroom”, but the rear bedroom photo has blinds drawn, a hint that there is little light and no view in the rear. In a bit of Additional Twitter Serendipity, I see the same JammySod @JammyPup whom I credited last week in my September 21, flip city: 99 Reade Street loft sold in 2011 sells again, up 4%, also provided a theory about the 2nd floor hate at 69 Murray Street. As in the update at the bottom of my December 29, 2011 post, he suspect the “v noisy bar” next door is responsible for the slaughter. I can’t say that I have experienced that very noisy bar on a very noisy evening (or in the wee small hours), but there has to be some reason for the huge spread between the 2nd floor at the end of 2011 and the 8th floor at both the beginning of 2008 and this month. The price represents a pretty good Tribeca premium, considering its South Tribeca location and (relatively) high maintenance for a coop without amenities. Silly me, as the facts (frothy as they may have been) reveal that the 8th floor was then worth $2.275mm, a mere 3% off the ask. Regular readers won’t need the archives to remember my August 15, indispensable source tracks commercial upgrades on Murray Street, in which I used a very useful review of restaurant and bar activity on Murray Street by hyper-local blogger Tribeca Citizen (“the intrepid Tribeca Citizen”) as an excuse to review loft sales up and down the street. The 10th floor next door sold to A Famous Couple, as was freshly recounted in my October 20, 2010, interesting price history of 71 Murray Street loft bought by Famous Couple. 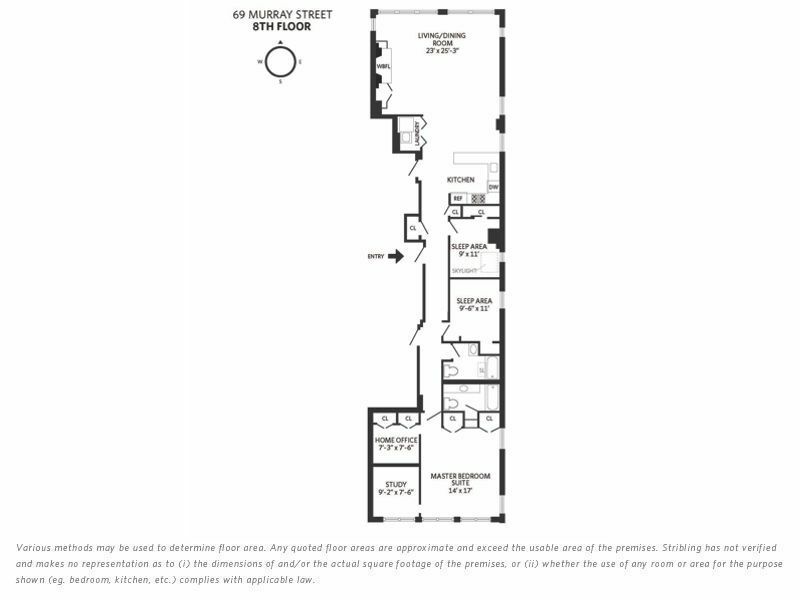 I will resist the opportunity for any Paul Ryan jokes, and note only that the 10th floor loft at 71 Murray Street has 4 exposures and boasted “dramatic northern city views”, yet it sold closer to the 2nd floor than the 8th floor of 69 Murray Street on a dollar-per-foot basis ($976/ft v. $847/ft v. $1,250/ft).